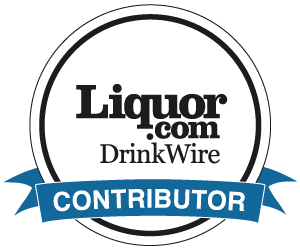 I met the Nelson brothers, of Nelson’s Green Brier Distillery, at this year’s San Antonio Cocktail Conference and visited with them again at TOTC. 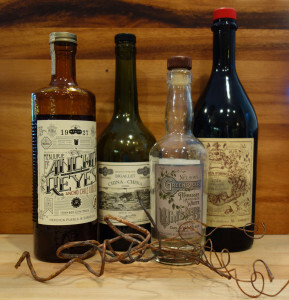 Their Belle Meade Bourbon is one of my favorites and with it I have created a number of cocktails. 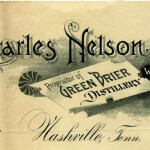 I first tasted their Nelson’s Green Brier Tennessee White Whiskey* at the San Antonio Cocktail Conference. 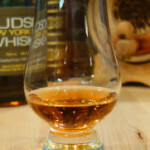 It is single distilled from a mash of corn, barley and wheat which gives it some subtle, but distinct differences from other premium white whiskeys. First, I think Nelson’s Green Brier is slightly sweeter and has a malty/chocolate note. Still present is the ‘bite’ you would expect from white whiskey. Previously, I was not a fan of white whiskey, but liking theirs, I have set out to design some cocktails using Nelson’s Green Brier Tennessee White Whiskey. I may have just had chocolate on the brain, or maybe it was molé, but the chocolate note I mentioned made me think of chilies and thus Ancho Reyes liqueur. 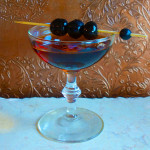 Add in Carpano Antica Vermouth and now it becomes something rich and complex. 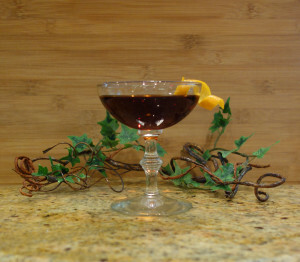 Being determined to gild the lily, I wanted to push the herbal flavors of the vermouth. So, I got esoteric and added Bigallet’s China-China Amer. 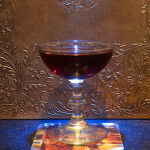 The Carpano has wonderful essences of dried fruits and bitter marmalade along with a little cocoa and red wine. All of which are enhanced by the China-China’s orange peels and bittering herbs bringing a little truffle like earthiness to the party. 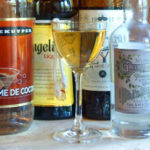 This combination complements rather than overwhelms or conceals the unique flavors of this white whiskey. Here’s the recipe that makes me smile! 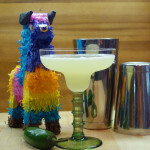 Add all ingredients, except the garnish, to a mixing glass with ice. Stir to chill.